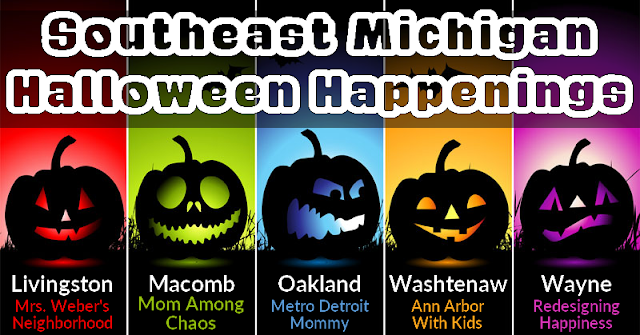 Mom Among Chaos has worked with local area bloggers to bring you the best family-friendly Halloween happenings in Southeast, Michigan! Make sure to share with all of your friends! Children preschool aged thru third grade $10. Adults are free. Pumpkin painting, spooky train ride, non-scary haunted house, corn maze, and picture scenes. A family fun-filled day in Downtown Romeo! From face painting and pumpkin bowling to a magician and more! Plus, the Romeo Farmers Market. Stroll through a covered outdoor area where you will find 1,000's of hand-blown pumpkins and gourds. There is also demonstrations of glass blowing. October 15, 2016, from 12PM-2PM. Each family will decorate their trunks and pass out candy. There will be tons of fun games, hayrides, and awards. Some items may have a small fee. Trick or Treating in the parking structure. Includes, Free pumpkin, professional pumpkin carvers, moonwalk, mechanical bull, pumpkin photos (4-6 PM), Wagon Rides. Dress up, dance, get your nails done, hit a haunted house, all in good fun. Limited to the first 700 tickets. Trick-or-treating for kids, and a best-decorated car contest for grownups at the St. Clair Shores store parking lot along with Billy's Blends Coffee House,Jimmy John's, Jet's Pizza - St. Clair Shores, Sanders. There will be games, craft, and a fall photo backdrop as well. Cash prizes will be awarded for the three best-decorated vehicles. Remember to load the car with goodies, too! To enter your car in the contest, contact Elizabeth P. as soon as possible. October 28, 2016, from 6-9PM. $30 per person. Tickets available on the website. Dress up in your favorite costume and join us for a PARTY! We will be building some FUN Halloween models including motorized bats! We'll have a pizza dinner, fun games, candy prizes and more! Enter to win the best costume includes food, music, and prizes. Go with the Spirits - Haunted History Tour with a Twist! Oct 28, 29, & 30 5PM-6:30 PM 1 1/2 hour tour. We do not recommend children under 7. Up to 20 seats available and they are going fast. Our tour is composed of history and ghost stories about Victorian homes in the Romeo Village. We tell tales that may seem spooky or give you a chill. Are they all true? It's up to YOU to decide. THAT'S TRANSPORTAINMENT! We encourage you to wear your best SPIRITual Costume and bring along your favorite "Spirits." October 29, 2016, from 4-5:30 PM. Bring your kids to the annual trunk or treat. Includes games, pumpkin carving, dunk decoration contest, and face painting. Includes music and businesses handing out candy. You must purchase a wristband ahead of time. Only 500 wristbands will be sold. $10 per person with timed tickets every half-hour. Tickets sold in advance only. Bring your little goblins to Ford House for an evening of Halloween entertainment! We’ll supply the bags to collect your Halloween treats and surprises, just bring your little ones in their fantastic Halloween costumes! October 30, 2016, at 9:15 AM. All prices vary depending on the day of registration. This race includes face painting, massage, DJ, medals for 5K and 8K finishers, and long sleeve shirt. This race is dog-friendly. Trick or Treating at the farmer's market. Feel free to dress up! Open to all. $5 per person or $15 per family. Free admission for those kids that wear costumes. Pre-register at above phone number. Includes swimming, crafts and snack. A safe alternative to Trick or Treating. This event is setup for ages 0-Fifth grade. Your child will receive candy, and there will be games. Prices from $12-25 based on age and attraction. One of the scariest haunted houses in the area. Free for kids 30 inches and under. $9.50 per person over 30 inches. The event includes three black holes, indoor maze, 40-foot slide, wagon rides, and six-acre corn maze. Prices from $9.95-19.95 depending on the event selected. Blake's offers Zombie Paintball Safari, SpookyLand 3-D Maze, 3-Story Haunted Barn and a Haunted Hayride. Live DJ every Friday & Saturday Night. Enjoy outdoor movies & bonfires under the stars every night. Every Saturday in October, 3 PM Tour or 5PM-6:30 PM Tour. Not recommend for children under 7. The tour covers many of Romeo's Haunted tales, legends, and fantasies. Are they true? It's up to you to decide.